Last weekend we had our very first kid birthday palooza. And it went really well! Building up to the day I did have a few moments of, “Why am I doing this?” because… ugh, party throwing on top of all the usual stuff. But this year, Gabe’s birthday party was not at our house for the first time, people were not sitting thigh to thigh on my coach trying to balance cake and cups of coffee, and I didn’t have to do any cleanup! Glorious. We booked a room at the Seattle Children’s Museum. Jungle theme to go with lightly jungle themed party. The price of 1.5 hours in the room included 30 guest admissions and a sea of tiny chairs. I made the cake! 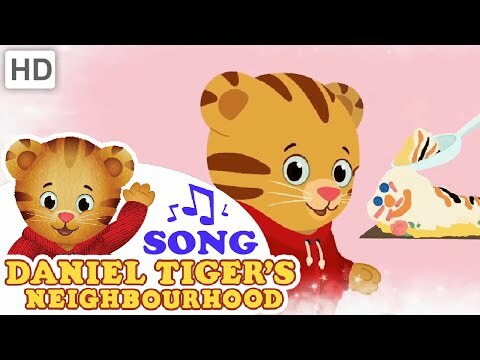 Daniel Tiger themed, a la this one. We bought natural, Trade Joes juice boxes and teensy bottled water for the kids, sparkling water for the grownups. There was candles and singing and presents. Tiger stripes! For a tiger cake! Thank you pinterest! We got the kids gift bags with a wind up snake, a spinning top, little animals stamps + stamp pad, figures of a butterfly, and a wild cat, and jungle themed crayons. These ones. Which I had to tell people were not chocolates. Ha! They sat, with their little juice boxes, and played with their goodies and ate cake for like 40 minutes maybe? They chilled for a long time. It was magical. And adorable. Seeing Gabe play with other little kids is so my favorite. The way he calls their names and the way they react to him and how they just kind of GET each other. I could watch that all day. And then we set the babies free. And they owned that place. It was hard to really capture the chaos because they were zooming past us so fast. By the end, the kids were sweaty disasters. Fae had completely tapped out. We loaded our tiny clown car with the babies and the left over cake, and the napkins, and plastic plates, and presents, and stroller, and diaper bag, and headed home. We were home and the kids were in the bath by 1pm. We spent the rest of the day lounging in pajamas. An excellent kid birthday had by all. If you’re looking for a birthday party location for your 2-4 year old, I highly recommend the Seattle Children’s Museum. So easy, and they were so incredibly kind to us. Oh it looks like so much fun. Birthday parties are the best. I love planning them . And this museum looks amazing. Well done you ! That looks like fun! I’ll have to keep it in mind to at least visit once we move. Oh how fun! I really don’t love the idea of throwing a kid’s party but this style sounds very doable. Next Next post: Episode 12: Is That What You’re Wearing?